This concert video was recorded in 9-September-1989 at the Shoreline Amphitheatre in Mountain View, California. This concert was also released in audio in the CD format first in 1993 in Europe (without "Ive Seen All Good `People", "The Meeting", and "Starship Trooper") and later in 1994 in the U.S. (still without "Ive Seen All Good `People" and "The Meeting", but with "Starship Trooper" as a bonus track). Bassist Jeff Berlin replaced Tony Levin (who became sick with hepatitis) for the last seven dates of the first leg of their tour in 1989 in North America. He had to learn all the songs in a very few days and with a very few rehearsals with the band, and he appears in this video doing a very good job. He did not play the stick bass like Levin but he made sound his bass guitar like a stick bass in some songs thanks to the use of some pedal sound effects. 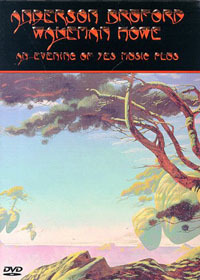 The video starts with Jon Anderson walking to the stage from the back of the seats of the Amphitheatre, shaking hands with some members of the audience and walking to the stage and singing at the same time for his solo medley (accompanied from the stage by Milton McDonald on acoustic guitar and Julian Colbeck on keyboards). It was unusual to start a concert in this way with three solo sections by Anderson, Steve Howe and Rick Wakeman, respectively. Maybe it was not a very good idea, in my opinion (it`s a bit boring for my taste), but they did it anyway. Anderson`s solo medley consisted of "Time and a Word", "Owner of a Lonely Heart" and "Teakbois". This medley sounds good, and after this, Steve Howe appears on stage to play two solo acoustic guitar pieces, "Clap" and "Mood for a Day", with an unidentified instrumental piece between both. After this, Rick Wakeman appears on stage to play a solo keyboards medley of "Gone but Not Forgotten", "Madrigal", "Catherine Parr" and "Merlin the Magician". A very good solo section by Wakeman, it is my favourite from all the solo medleys played by ABWH. Very well played. After this, all the other musicians appear on stage to play "Long Distance Runaround", followed by a good drums solo played by Bill Bruford. This is followed by "Birthright", which has Howe playing acoustic and electric guitars and a mandolin, Bruford playing very good drums and percussion, Wakeman playing a very good keyboards solo, and Anderson playing a bit of percussion instruments. The next song is "And You and I", played very well, and I consider this version as the best live version that I have listened to from this song. The next song, "Ive Seen All Good `People", is also played very well, and it also has an extended final section on which McDonald, Colbeck, Howe and Wakeman share solos. "Close to the Edge" is also very well played. "Themes" has Wakeman playing good solos too, and "Brother of Mine" is one of my favourite songs from the ABWH studio album, played with a lot of energy with good solos by Howe and Wakeman. For "The Meeting" only Anderson, Wakeman and Colbeck appear on stage, with Wakeman playing the piano and Colbeck the backing keyboards. "Heart of the Sunrise" is well played too, but in this song the electronic drums don`t sound very well for my taste in some parts. "Order of the Universe" is very well played, and it is mostly a rock song with some influences from the 80s Rock Pop music. "Roundabout" is very well played, very similar to the studio version. The concert is finished with a good version of "Starship Trooper", which also has an additional keyboards introduction and also a keyboards section before "Wurm" on which Anderson sings a bit from "Nous Sommes Du Soleil " (from "Ritual") and also gives final thanks to the audience. The final part of "Wurm" has good solos by Wakeman and Howe. Bruford used mainly an electronic drum kit with also an acoustic snare drum, metal cymbals, two gongs, and a triangle. I am not a fan of the electronic drum kit, but the songs from the ABWH required a lot of changes in the sounds of the drum pads. I thought that Bruford programmed some parts, but no. It seems that he played everything live. Used in this way, the electronic drums sounded very well and offered more choices to Bruford to play interesting percussion sounds in this drum kit. Anderson sang very well, and like the other members of the band he looks like he was enjoying playing the concert. Wakeman used eight keyboards which also had a lot of pedals. The new technologies from the eighties really helped him to sound better. He used some Korg, Ensoniq and Roland keyboards, and it also was on stage an old analog Mini- Moog synthesiser which I never saw him play in this concert. Howe also used a lot of electric and acoustic guitars (Fenders, Gibsons, and maybe others), a pedal steel guitar, plus a mandolin and a vachalia. The backing vocals were sung by Howe, McDonald and Colbeck. I don`t know if Berlin sang backing vocals too. Of all the members of the band he is the only one from which there are fewer close-ups and he remains "in the dark" for most of the time. It seems that he was playing a five string bass guitar, but I am not really sure about this. He really did a very good job replacing Tony Levin at a very short notice. Colbeck and McDonald played and sang very well, and gave some freedom to Wakeman and Howe to play in a more relaxed way, particularly in the songs from the ABWH studio album which really required their presence in this tour. In conclusion, this is a very good video from a very good concert which was played with a lot of enthusiasm and energy from all the musicians. I enjoyed very much to watch to it.